In this situation it is difficult to analyze the state of the nation in an objective way. That’s why an outsider’s view could be instrumental to bring in new ideas and much-needed changes, and to suggest relevant best practices. Company Assessments are tools and services for evaluating the performance of all key systems and processes of the company. 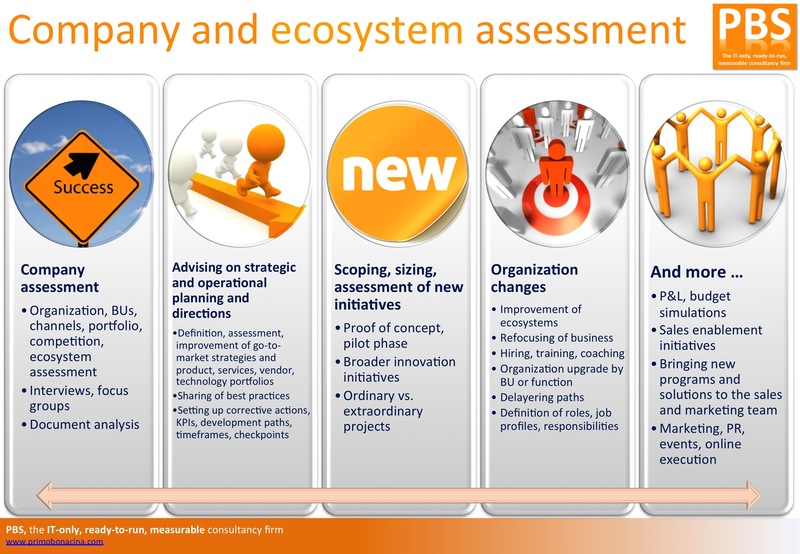 Executives worldwide are turning to Company Assessments to help gather more complete information about the departments and processes which they manage and to help their organizations compete more effectively. How your company rates against its competitors? The threats or opportunities that exist within your market? Your Assessment begins with a SWOT Analysis (Strengths, Weaknesses, Opportunities and Threats) and includes a thorough review of each specific area of your company, including Management, HR, Accounting, Sales & Marketing, IT, Operations and Business Development. The Company Assessment helps you to “see the big picture” and to put priorities in perspective… an instrumental part of the strategic planning process. Companies can no longer survive by producing and marketing a product or service. Managers must embrace the idea of constantly upgrading and improving the way in which they design, produce and/or deliver their products and services. While financial audits are a necessary and accepted part of most companies, innovative and progressive companies have recently begun to apply the audit concept to a broader range of management processes. Financial audits have traditionally been used to monitor a company’s financial performance in comparison to a set of rules and standards. Company Assessments help managers to define the processes for which they are responsible, measure results and identify possible improvements. Helps determines customers wants and needs.